I’ve already reviewed The Cabinetmaker -based in Glasgow telling the story of a local cabinetmaker, Francis Hare, father of a murdered son, and John McDaid, a young detective on the investigation. It is an intricately plotted book which had me totally gripped. Burial of Ghosts by Ann Cleeves is a standalone book, not part of either her Vera or Shetland series. Lizzie Bartholomew, a social worker is on leave after a particular nasty episode which has left her traumatised. After a brief holiday affair with Philip Sansom in Morocco, she is surprised when he left her £15,000 in his will. But there are certain conditions she is required to fulfil, which plunges her into a terrifying situation. This is largely a psychological study, focussing on Lizzie, as she relives her past in flashbacks. 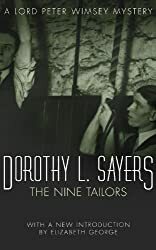 All three books are good reads, but my Crime Fiction Pick of the Month for April is The Nine Tailors by Dorothy L Sayers, one of the Golden Age crime fiction writers. It’s a Lord Peter Wimsey Mystery, first published in 1934, by far the most complicated book of the three crime fiction books I read in April and the most fascinating for a number of reasons. It had me completely baffled, first the bell-ringing, and then the twists and turns and all the red herrings. A few weeks later Wimsey is asked back to Fenchurch St Paul to help solve the mystery of the dead man found by the sexton whilst he was opening up Lady Thorpe’s grave to bury her husband. The identity of the dead man is unknown, his face was mutilated and his hands had been cut off – who was he, who killed him and why? And what is the significance of the enigmatic note found in the bell-tower? It’s not an easy crime to solve and involves Wimsey in a trip to France as he tries to identify the victim. An added complication is the mystery of the missing necklace, stolen from the Thorpe family but never recovered. I think one of the things that makes this such a good read is that it’s not just crime fiction, not just solving a puzzle, but it is also a fascinating portrait of the Fens, of their bleakness and isolation; of society in the 1930s with its rigid class divisions into gentry, clergy and villagers. The last part of the book is dominated by the floods as the sluice gates failed to keep back the water flooding all the low-lying ground, despite the new drainage works. It reminded me of the floods in the Somerset Levels this last winter, with various water authorities disputing responsibility for the disaster. Above all, it is novel in which everything works well together, the characters are individuals, their behaviour is true to their beliefs and passions, and their conversations are realistic. It begins with a leisurely pace, with lots of detail about bell-ringing, which sometimes seemed a bit unnecessary to me, but as the plot unfolded I realised that I was wrong and I needed to pay more attention to the detail. It is essential to the plot. After this leisurely start the pace picks up as Wimsey and the police try to untangle the mystery. An enormous stillness surrounded him. The moon had risen, and between the battlements the sullen face of the drowned fen showed like a picture in a shifting frame, like the sea seen through the porthole of a rolling ship, so widely did the tower swing to the relentless battery of the bells. The Nine Tailors is the first detective book by Dorothy L Sayers that I have read (previously I’d read The Descent into Hell, extracts from her translation of Dante’s Inferno). It’s her ninth Wimsey novel and I intend to read more. So pleased you enjoyed Nine Tailors so much. I realised that I was probably not taking all the bell-ringing details in properly either. But the overall atmosphere of The Fens was superb. I shall read it again one day. Am also looking forward to reading more Wimsey books… I can thoroughly recommend Have His Carcase. I have to go back and read some Dorothy Sayers! Between you and Cath, I am reminded that I have forgotten all the plots from when I read them 30 odd years ago. Both of you made this one sound fascinating, and I do remember really enjoying them when I read them. Fascinating review, Margaret. Glad you and Cath are enjoying them so much, too! “it’s a book that you have to read with care” – I really like that. That’s why I love reading. I like the solid attention needed and the learning that comes because of it. Such a good review, Margaret. I don’t think I ever really understood the bell-ringing bits (rather like when I can’t make sense of detective story complex train timetables! ), but it’s such a memorable Sayers novel – the setting is so well done one sometimes forgets there’s a crime going on! Margaret – Oh, I liked The Nine Tailors very much too. It’s a solid mystery, there’s fascinating information about change-ringing, and I do like the vivid depiction of East Anglia. And Lord Peter’s reaction when we learn the truth about the mystery is memorable. I want to read The Nine Tailors now. Thanks for a great review as I haven’t read any of her books since a rainy weekend in Wales many, many years ago and I think this one sounds perfect. I love The Nine Tailors–I read it about 18 months ago and thought it a perfect mystery, for all the reasons you state. I really enjoyed learning about bell ringing (I will never forget the All Creatures Great and Small running riff on Tristan joining the local bell ringers because they mostly drank a lot and rang a little) and the Fens, and I loved the part with the flood and the sluices and all that. Honestly, I cannot believe this is your first Sayers! What fun you have ahead of you. It really is too long since I read any Dorothy L Sayers. I read them all in my teens, but none since. I’m sure I’ll love them if I can make time to read one again. I’ve always loved this book. Because of this I have also enjoyed a series by Jim Kelly beginning with The Water Clock with the fenland setting.